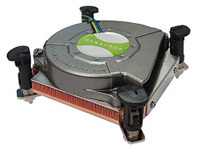 Dynatron K2 Low Profile, 27.8mm High Side Blower Cooler suitable for fitting Intel Socket 1150, 1151, 1155 and 1156 motherboards with up to 73W TDP processors into a 1U Chassis. Long life two-ball bearing fan draws the cool air though the fins and extracts hot air to one side to support chassis airflow. Intel approved push pins provide maximum compatibility. Pre-applied high performance TIG830SP thermal compound ensures clean and easy installation. Case Compatibility: Side Blower design suitable for use in a 1U chassis. Tip: angle the K2 to force air out of the rear of the chassis. Compatible motherboards: All Socket 1150, 1151, 1155 and 1156 Mini-ITX Motherboards with up to 73W TDP Processor fitted. Installation Tip: Configure your BIOS to run at 40% fan duty up to 50C for quieter operation. Specifications: Fan speed: 1000 RPM (at 20% Duty Cycle); 2500 RPM (at 50%); 4000 RPM (at 100%) (PWM controlled); Airflow: 8.3 CFM (at 50%) - 11.9 CFM (at 100%); Air Pressure: 0.087 inch-H2O (at 20%); 0.453 inch-H2O (at 50%); 0.929 inch-H2O (at 100%); Noise level: 37.8 dBA (at 50%) - 44.0 dbA (at 100%); Power Consumption: 0.6 W (at 20%); 1.8 W (at 50%); 4.8 W (at 100%); Weight: 380g; Fan Dimensions: 75 x 75 x 15mm; Overall Dimensions: 82.6 x 81 x 27.8 (H) mm.